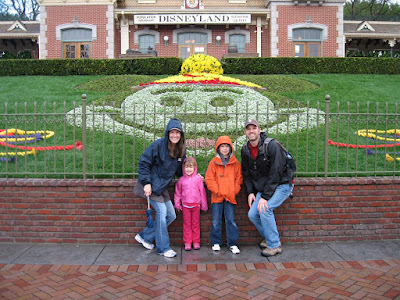 confessions of a former miss-know-it-all: Disneyland! So, we get to California. I will spare you details on the white knuckle drive from the airport to the hotel. Three words: RAIN, RUSH HOUR, L.A. Oh, and a few more: NIGHTTIME, Gavin CLAIMING to be "night blind" so I had to drive, AND on a road that I had never driven! Add to that-drivers who make Bostonians look passive, and that was about as much adrenaline as I wanted for the rest of the week. The good news: our hotel! Like a block from Disneyland, with a bedroom for the kids, and one for us, a full kitchen, and right around the corner from The Cheesecake Factory, WITH a great selection of Pay-Per-View movies...yeah! So as soon as we get there we cuddle up in the big room and watch...I can't remember...some kid movie. And the next day....... D I S N E Y L A N D!!!!!!!!!!!!!!!!!!!!! Dalton is a softy for people dressed up as characters... always has been. I was glad to see that he had not become "too cool" for it. So, I have to admit that I had it easy because we were dividing up in to the "girl team" and the "boy team" of which one little team member LOVES roller coasters and the other little team member HATES them. Any guesses whose team I was on? 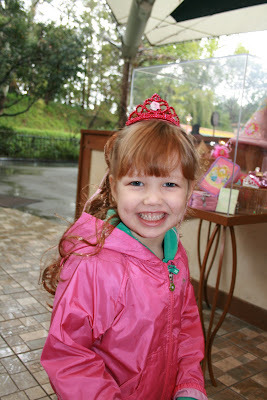 Yeah, I was on the princess-loving, carousel-horse-riding, Pixie-Hollow-loving team. 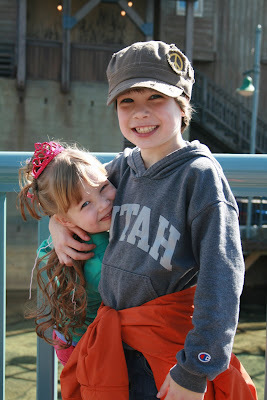 Gavin was on the rides-that-make-you-want-to-barf-your-brains-out-over-and-over-and-over-team...lucky him! when we caught up with Gavin an hour later, he asked us what we had been up to, since they had already ridden four different rides, and I told him that we'd tried out every "gorgeous" horse on the carousel. The worker who ran the carousel had let Shelby know that she was riding on "Mary Poppins horse", and that it was the leader of all the other horses, so of course we had to ride on it as many times as possible. ...........And on, and on, and ON!! So, while we are doing horseland, Dalton and Gavin are doing barf-land. 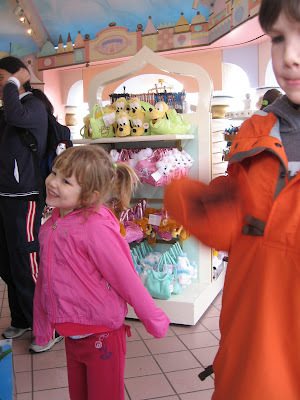 We caught up with them and went on Mr. Toad's wild ride, which Shelby HATED. She clung to Gavin and screamed the entire time. It is a pretty stupid ride. I mean who, under the age of fifty, knows who Mr. Toad is anyways?? 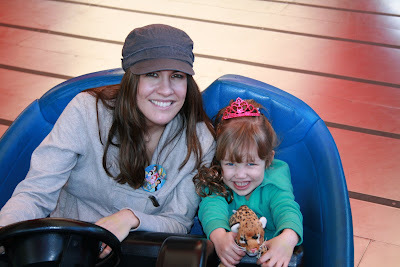 Then we went on the BRAND-NEW-AWESOME-DARLING-CUTER-THAN-ANYTHING "It's A Small World" ride. 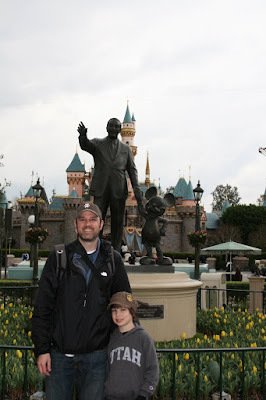 Okay, I had been to Disneyland as a child, and this was by far, my fondest memory. And the new version blows the old one away. Of course, Dalton NOW will say it was TOTALLY lame...whatever. 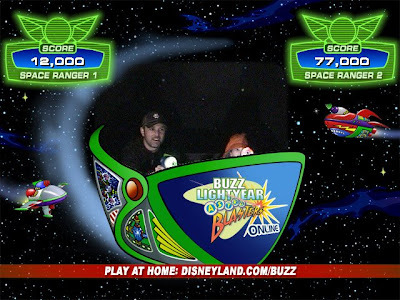 We ate lunch ($$$$$$) and went on the Buzz ride. 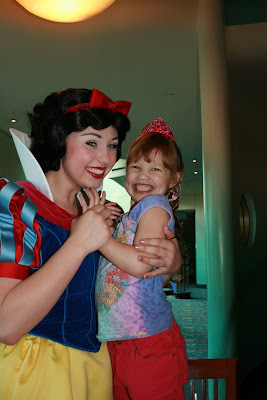 The only way that Shelby did not hyperventilate was the fact that she was shooting the bad guy (Zurg) the entire ride. For little kids it was a pretty good ride. 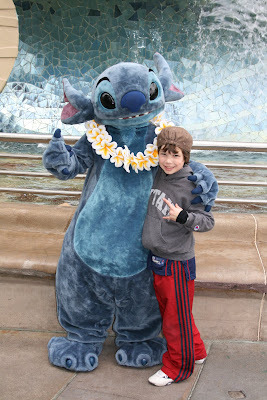 We went back to the hotel after a few more rides, where we AGAIN, climbed in bed, the kids watched Beverly Hills Chihuahua while we ate YUMMY food from the Cheesecake Factory that Gavin had walked over and picked up. And once the kids went to bed, we watched Slumdog Millionaire (LOVE IT). But this was THE DAY! 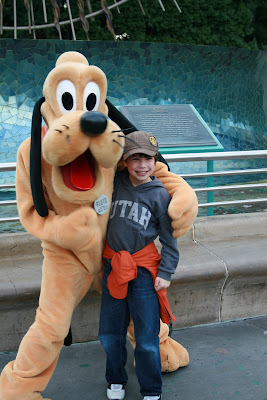 So Dalton and Gavin spend the day at California Adventureland, where they ride The Screamer about 100 times. While Shelby and I prepared for princessy heaven. Now Shelby is not a big princess girl. 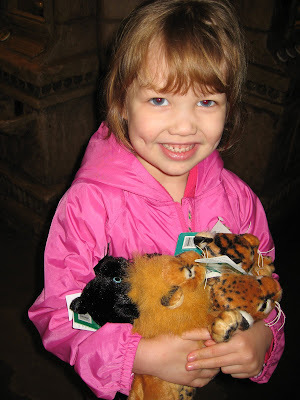 She has always preferred their horses. But when in Rome! Shelby wanted to eat her. 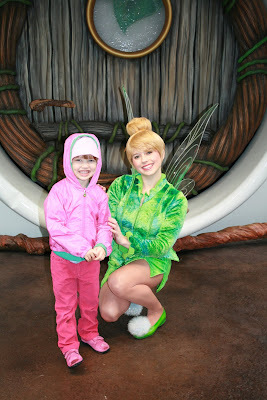 It was all she could do just to pull her eyes away from Tink for three seconds to look at the camera for a picture! She had to drink it all in, and QUICK, cause there are 100 other girls waiting for their turn! 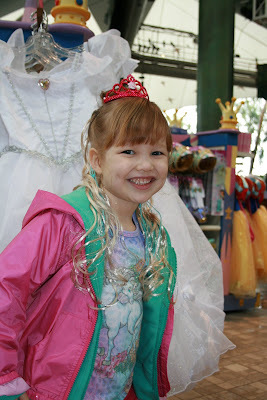 There are twenty other pictures with all the other fairies, but this was the only one I took and the ones that you get from Disney online are a royal rip off, so this is the only fairy pic you will see. So sad. 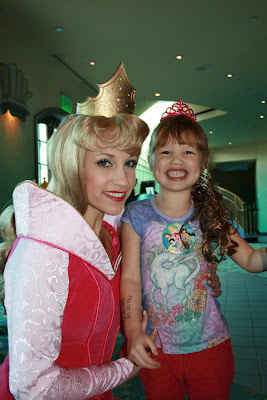 On to the Princesses. Again, there were lines, but I guess it was a tenth of what they normally are. So, twenty minutes instead of hours. Worth a few sprinkles, I'd say. 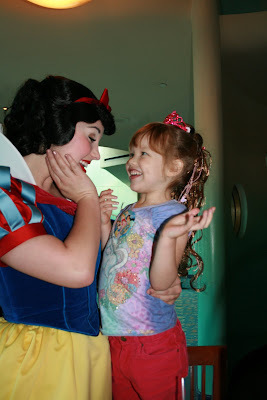 She saw belle, Ariel, and Jasmine. 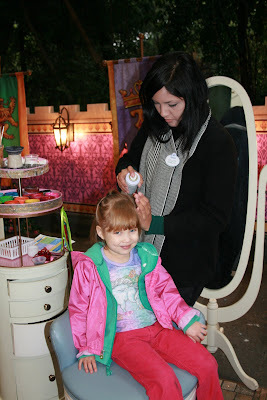 And then it was on to the beauty parlor next door, where for the low, low price of $30, plus another $10 for the hair extension, and another $5 for the crown, you too can look like a Disney Princess (dare to dream). So again, when in Rome, and when you are four years old and are at the age where this is all really special and not stupid, then I say "Let's go ALL THE WAY BABY!" I have to admit to getting a little Tammy fay Baker at one point during the "stylishing" process, as Shelby would call it. The stylist was not living up to my $50 expectations and so I had to intervene a few times. OK, now I was really starting to feel like one of those pagent moms, "No, the hair extension should go AROUND the bun, not under it! 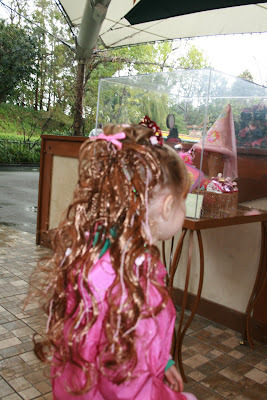 And, yes, I know her hair is uneven but I have put it in a bun before so I know that you can do it." Sadly, she didn't blink an eye lash. She must get a lot of this. Atleast it's good to know that Fantasy Land doesn't just bring out the best me, but all other mothers who have overpaid for some childhood fantasy of their own that they never got to fulfill. 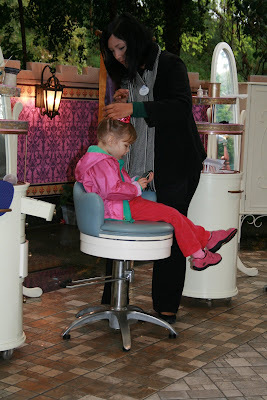 And this was the moment that I realized that my daughter is no longer blond. Well, technically she is. I mean, in my family anything lighter than coal is considered blond. 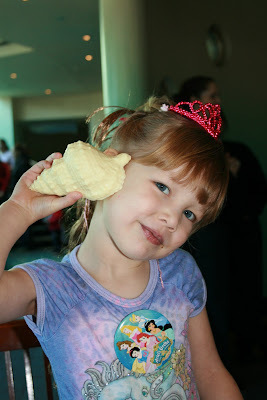 But once she had on the blond hair piece that I'd picked out for her, I realized that maybe she was moving in to the brunette family with the rest of her DNA-linked clan. I mean, we aren't going for Mickey Rourke from The Wrestler, here. Oh, and got THE MOST GORGEOUS AURORA NIGHT GOWN IN THE WORLD THAT WE WEAR EVERY NIGHT TO BED THAT COMES TO THE FLOOR AND HAS HORSES ON IT! and THIS was made of chocolate! 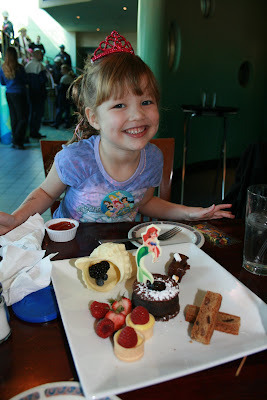 As was the little Ariel on the plate. So she promptly devoured both. While you are eating there is an official of the court with a trumpet who announces the princesses, who then make a very grand entrance with all the girls ooohing and awwing. 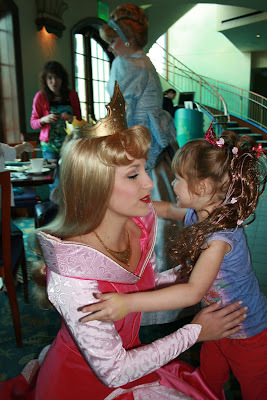 The princesses make their way through the dining area, giving hugs to the girls, while also teaching them princess-essentials like how to properly curtsy and wave. All the while I am getting texts from Gavin saying that he is about to puke because they have ridden so many rollercoasters. 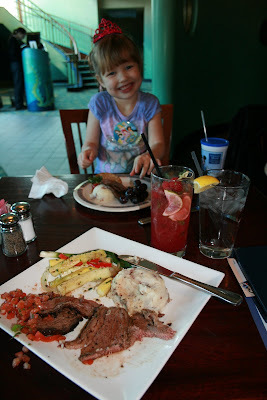 I have to chuckle as I take a bite of my tri-tip and herbed mashed potatoes with summer squash whist washing it down with a sip of my raspberry mojito. The boys come over to princessland to pick us up (I think Gavin needed a break as he was starting to look a little green), and Shelby fills them in on all of her marvelous adventures so far. I can tell that Gavin is a little peeved that I have had it so easy, especially when he sees the bill for lunch..."once-in-a-lifetime", I have to keep repeating to him. I know that he is wondering when this turned in to Shelby's birthday adventure as well as Dalton's. Then pet the stray cats who eat our string cheese off us. 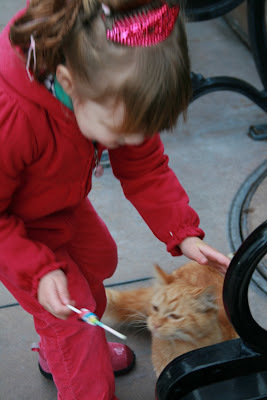 Gavin tries to convince the kids that they have rabies, but I think Shelby heard "rubies". 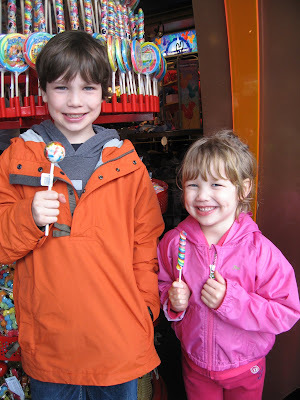 We went on a few more rides and then headed back to the hotel where we picked up our rental car and drove to Uncle John and Aunt Melanie's house for dinner with the cousins! 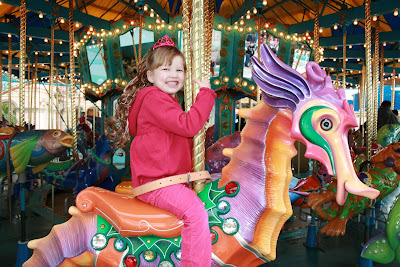 We found ANOTHER carosel at California Adventureland, where Shelby took turns riding EVERY sea-creature on the thing. And while she and dad did that, I got my kharma returned to me by being forced by Gavin to accompany Dalton on The Screamer. It started to rain pretty hard, which just added to the haenousness of it. I HATE ROLLERCOASTERS. The good part was that Dalton LOVED to watch me suffer. Made it that much sweeter for him. 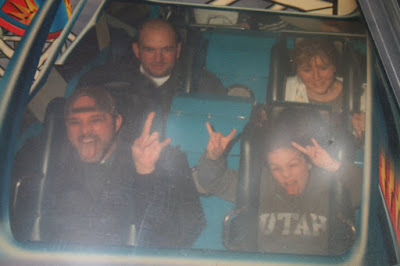 So, we also went on Thunder(puke)Mountain together...him busting a gut the entire time as I scream my guts out. I think I have pics and video of this on my phone that one day I hope to learn how to retrieve. Some day I will add them. 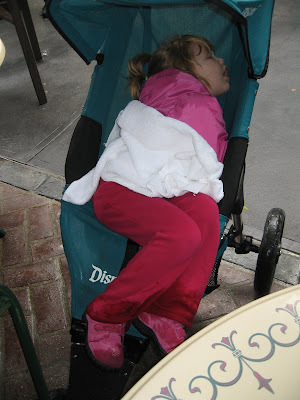 We went on all of our favorite rides one last time, and then we were done! 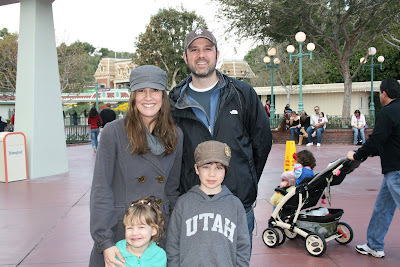 Bye, Bye Disneyland! See you again on Shelby's 8th Birthday!